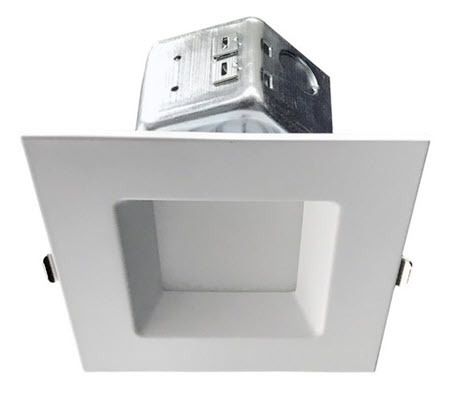 Morris LED new construction 4 inch square recessed light fixture is made for new installations. It's so like a standard recessed light fixture, no one will know that it's an LED down light retrofit. This is a versatile light source for most as a six-inch recessed downlight fixtures. Compatible with 120 volt systems, the 10 watt LED retrofit delivers 732 lumens with excellent uniformity and color rendering and warm color. And let’s talk about energy savings. You will get excellent energy efficiency over the old incandescent type line voltage lighting. You can replace those with a retrofit in many cases especially if you already have the holes in the ceiling. But if you don’t and it’s a new construction situation, then you can attach some of these directly to an electrical box or use the light fixture that has the electrical box already attached to it. We have that as an option as one of our products, and it makes things very simple and easy just making the wiring connection inside that box, and you’re done. If you want to know how much energy and money you’re going to save over your existing system, be sure to download our Excel spreadsheet on the left-hand column of our website. This will give you everything you need to see exactly how much you’ll save. You’ll find that the paybacks are very fast, sometimes within the first year. But for many businesses and home uses the payback may be anywhere from 1 to 3 years, and that can be shortened by any utility rebate incentives that might be offered by your electrical utility. It’s something to look into to make sure that you’re getting the best possible. There’s never been a better time to take a look at changing your lighting to something that’s more energy-efficient that can save you money and will look a lot better than what you had.